Home / Living / Home Decor / Our Floor Story – Moisture in a concrete slab foundation. Our Floor Story – Moisture in a concrete slab foundation. Since a lot of people have been asking, I thought I would share a post about the house problems we had that led to choosing luxury vinyl plank flooring. I can only tell you what our experience has been, and I am not an expert on this subject. We have a concrete slab foundation in California without a crawl space or basement of any kind, and our house is about 15 years old. I am not responsible for any choices you make for your house, and I recommend contacting a qualified flooring professional. After we purchased our house, we noticed that there were dark spots on the bamboo flooring, around the perimeter of the rooms. The furniture had been covering most of them at the time of inspection, so it went unnoticed by the inspector. When we did our final walk through, we didn’t think anything of it, since we knew we would be replacing the floor anyway. The day we closed escrow, we had the rooms measured for flooring, and the contractor said his moisture meter was reading high on the spots. I had no idea what that could mean. I began tearing up the flooring that night, and found something that no homeowner ever wants to see… mold. It was spotty in most places, but it ended up being the worst in the downstairs bedroom at the corner of the house. One thing that was baffling was that the mold was under the flooring only. The walls and baseboards were fine. In fact, the under side of most of the floor boards looked fine too. Most of the mold seemed to be growing between the underlayment and the foundation. 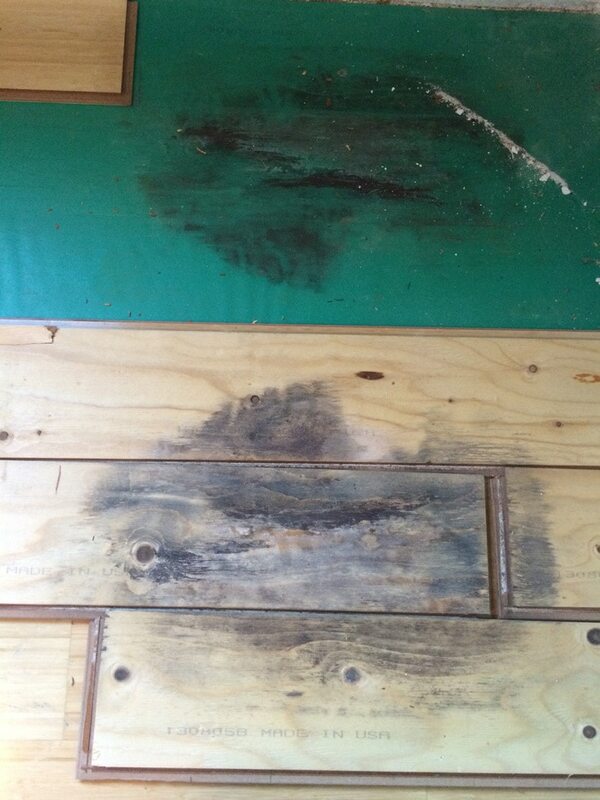 This was the only spot where the moisture levels were so high that it made it through the underlayment onto the wood. The other spots just showed a little moisture damage and darkness on top. In a panic, I called a couple mold remediation companies that came out to assess the situation. The quotes I received for mold remediation were outrageous. We’re talking tens of thousands of dollars! One company was talking entire kitchen remodel because the mold might have gotten into the cabinets, and another one wanted to wipe down every inch of wall, ceiling and surface with Simple Green. I don’t know how you can take advantage of someone when they are standing in front of you in tears, but the mold remediation companies we called proved to be pretty crooked. I’m not one to just give in, so I went online and began to research mold remediation. Turns out, you can do a lot of mold remediation yourself if the problem isn’t that bad. The CDC says that you can take care of the cleanup yourself if the moldy area is less than 10 square feet. Here is a link to where you can download a great cleanup guide if you are interested. So, we got to work! We wore masks and gloves, taped up plastic in the rooms that had mold, and removed all of the flooring. Since we were getting the carpet replaced anyway, we went ahead and tore that out too. We didn’t want any spores hanging out on the soft surfaces of the house. Then we mopped and scrubbed the concrete with a mixture of bleach and water. When that didn’t take care of the smell, we mopped again with vinegar and water. We set up box fans in the windows to help blow any spores in the rooms out the windows while we were working. Then we rented a big air scrubber for a week for about $400 to filter out any spores after the cleanup. Of course, if your mold problem is bigger than what the CDC recommends, you’ll need to call in the experts. We did not pay for any testing of air quality as this would have been a waste of money in our situation. We just cleaned it up and filtered the air. Don’t panic. Just like with the mold remediation, there were plenty of contractors that were willing to take advantage of my situation. Always take time to calm down, do some research, and make an informed decision. Test your moisture levels first. At first, I didn’t think this was necessary. We already knew we had a problem, so why did we need to test? Well, you need to know how bad of a problem you have. I went to a local flooring supply store (Tom Duffy) to purchase a few calcium chloride tests. Once the tests were done, I could take them back to the store to weigh them for free. If you don’t know where to find a flooring supply store near you, call a flooring contractor and ask where you can purchase the tests. This was much easier than trying to mail tests out and wait for results to come back. Our tests came back anywhere from 5-7 lbs per 1,000 square feet. 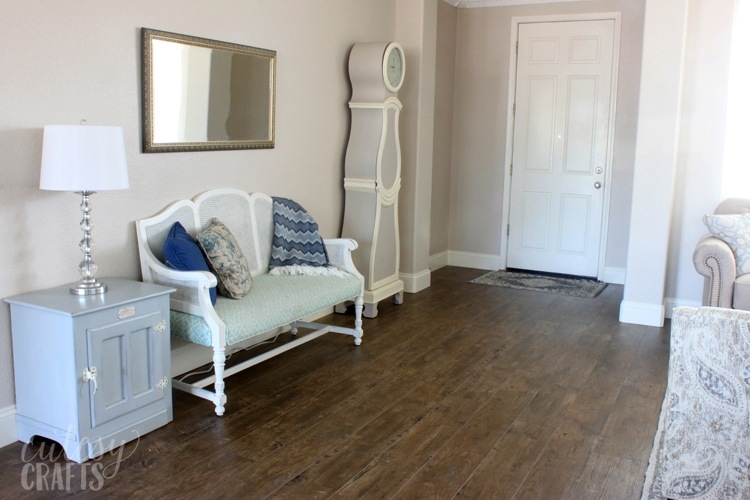 A regular laminate floor can usually only handle about 3 or 4 lbs. Talk to a flooring expert (make that THREE flooring experts). When I first started researching this problem, I was calling mold remediation and moisture mitigation experts. They were all about worst case scenario and wanted to do whatever it was that would get them the most money. When I finally talked to some flooring experts (not ones from a big box store like Lowe’s or Home Depot), I got some real advice. The man working at the flooring supply store knew plenty of reputable contractors that he was happy to give me contact information for. Why do I say talk to three flooring experts? As a rule, I always get at least three quotes/opinions. I feel that gives you the best idea of who is being honest with you, and who is trying to rip you off. In the end, it boiled down to four options for us. Seal the foundation. There are several different ways to seal a concrete slab foundation. I don’t know if any of them really work, but I can tell you what options we were given to us. One company wanted to grind down the top layer of the foundation and then apply an epoxy coating to seal the foundation. This would have cost about 5 grand for 1200 sf downstairs. Since our moisture levels weren’t that high, a couple contractors also recommended painting on a sealer that would have been less expensive. In theory, we would then be able to get whatever flooring we wanted. This scared me though, as I found conflicting information online as to if this would really stop moisture mitigation. Without knowing what the problem was, how could we be sure this would work? Get carpet. This wasn’t really an option for us since part of the floor would be in our kitchen. Carpet breathes, however, so this can be a good choice for some. Get tile. This was an option that we seriously considered. However, with installation prices so high, we did not go this route. Get luxury vinyl plank. This was what we ultimately went with, and you can read more about the pros and cons here. Since our moisture levels weren’t that high, this was an option for us. If your moisture levels are too high, this still might not be a good choice for you. Whatever flooring option you choose, be sure to read the manufacturer’s installation instructions to find out how much moisture the flooring can tolerate. We found these easily online. This flooring might be waterproof, but that doesn’t mean that you won’t have a mold problem. We still used a really nice underlayment with an extra moisture barrier just in case. So did we ever figure out what was causing the moisture problem? 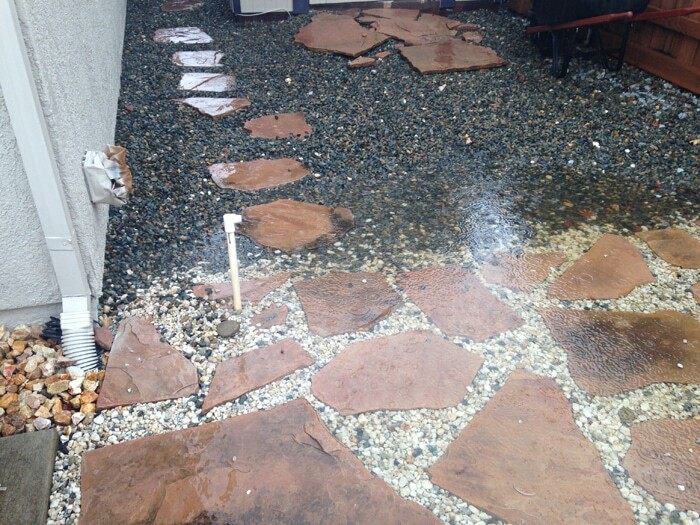 Once the rain started, we found that grading and drainage around the house were done improperly. Water was pooling around the foundation and was the worst in the very same corner of the house where we had the worst mold. Concrete is like a sponge and will soak up water in the environment. The moisture then gets trapped at your flooring, builds up, and then grows on any organic material it can find. A moisture barrier that you put down under your flooring can only take so much. That’s why you should always direct water away from the foundation of your house. We installed several new drains around the house to help with the pooling water, and I’m crossing my fingers that they will eliminate the problem when rainy season starts again. 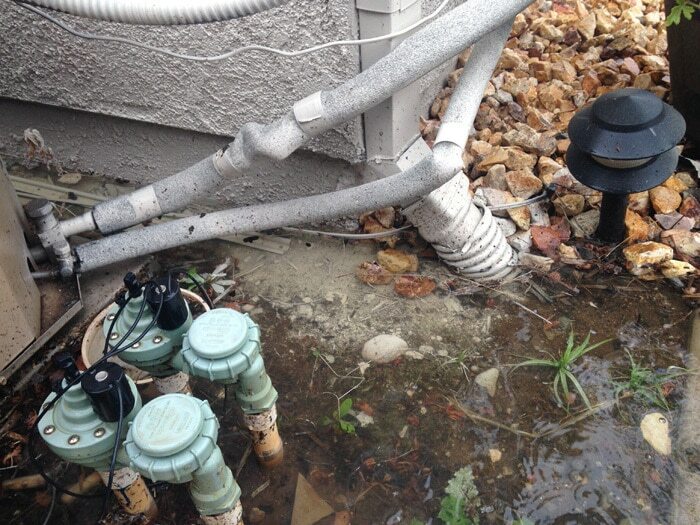 If you have a similar problem, you might even consider getting french drains installed all around the foundation. Luckily ours was a relatively simple solution, but I know there are lots of things that can cause high moisture levels in foundations. Again, I can only talk about our situation. Best of luck to those that are battling with some other moisture problem. I know what a nightmare it can be! Feel free to leave a comment with what you decide to have done to fix your problem. It might just help someone else out there that is dealing with it too. Nice article. I m so proud of you. Smart girl. Thank you so much for writing this article. I have a little house on the lake of the Ozarks in Mo. I’m dealing with this now. It is so hard to get reliable contractors here. Spent $24 thousand on a licensed civil engineer to address my drainage problem and he only made it much worse. I have now found an excellent contractor who is fixing my problem. It is costing me another $26 thousand! Don’t assume just because someone who has a license is better than a good contractor that has years of experience. Oh my gosh! That’s awful!!! I really hope your new contractor is able to resolve the issue for you. Yes, they are supposed to have a barrier under the foundation. We also have to put a moisture barrier under flooring (between the floor and concrete). I think the barriers can stop some moisture but not all, and they can only take so much. Also, these houses weren’t built with the greatest of care. The neighborhood is plagued with window leaks due to improper flashing, and we have also had roof leaks. 🙁 I think foundations are supposed to be inspected by the county, but who knows. If you happen to have a walkthrough of what you did to install your drains, that would be super helpful – we have pooling around our foundation that we need to figure out how to move. I hired a landscaping company to take care of mine. I recommend getting quotes from a few to see their opinion of your specific situation and costs. I noticed the spots where the water was pooling and told the landscapers exactly where to place each drain. We already had large drain pipe leading from our lawn and roof downspouts to the street in front of the house, so they just had to dig down and tie the new drains into the existing pipe. They also had to redo the entire slope of the drain pipe on one side of the yard, leading out to the street, as it was draining too slowly. The new drains we used are bigger and have a catch basin for easier clean out. If you have a lot of water pooling around the house, you might want to think about doing French drains or redoing the grading of the yard to go towards the drains. I hope that helps! I dont know if my problem is being caused by the same as yours, it sure sounds like it. I know u said to calm down. However, my first problem was getting somene to believe i was seeing these changes. They were suttle at first. I only wish they listened to me then. ( them meaning a man, my husband) he made every excuse for everything. Now I don’t even know where to start. We inherited my husbands parents house. They had money at the time. The whole house is made of wood floors terra cotta floor in the kitchen and florida room..( that room is all wood..and Windows that leak like crazy…stone walls and brick fireplaces. I lived as a kid in a normal house. Also stainless steel everything. Now my problem….thinking my husband since he lived here as a kid until adult knew when and how to take care of a house like this. I would be doing the normal cleaning. My problem#2…our drains around the house were getting blocked with debris. We found out because our basenent flooded about 4 or 5 times. I dont know why he didn’t just fix it right in the first place because the pooling u talked about was terrible around the house especially in the front where the basement leaked. He finally put a gutter guard on..problem #3 … He forgot to connect the gutter back on to face away from tje house and had the worse flood yet!! #4 I live in pa. The weather just turned really cold and BAM!! it seems like everything ive been saying and seeing exploded. The stone walls have efforescence and both quarry tile floors. The wood has some type of mold or something different everywhere. The wood walls in the batbroom are turning whitish. I tru to mop floors and feel a gooey substance sometimes. The kitchen quarry tile has a crumble in one section. I could go on. I’m scared mostly because of health issues for my kids and grandkids…losing entire house just w everything. I most upset that if he would of listened and believed me sooner we might be in a better situation. I had to find everything out on my own. So for the guys out there. Woman know way more than u give us credit for. Not all of u. Now this could cost us thousands and thousands of dollars that we dont have. The part that amazes me is he will still try and say its anything but what I’m telling him but when my uncle came over tonight and said the same thing he said nothing. SATISFACTION for me. But not really cause it will be sad if we can’t stop this and fix it because it is his child hood home and it is beautiful. All I wanted to do was prevent something like this cause I knew time was an enemy. Any help or advice would be so appreciated. I’m SO sorry that you are dealing with all of this! What a nightmare! Basements are not common where I live, so I don’t have any experience with them. If I were you, I’d get a few contractors over there to see what they say. The more opinions the better. You don’t have to commit to anything, and you’ll weed out anyone trying to rip you off. Leaky windows are definitely going to cause a problem. One thing we did that helped us catch a roof leak that was coming down the wall was purchase an infrared camera that attached to my phone. You could see the water coming down inside the wall when it rained. It didn’t help as much with our window leak though. I hope you are able to get it figured out. Such a stressful situation to be in!!! Hey Jessica, Thanks for your story. I am in the decision making of what to install in my house due to having very moist slabs living in a very low area of Florida. We have drains on each side of the house but still our elevation is low and I know we have very moist slabs. The tile has been fine since it breaths through the grout & it was down when we bought the house in 2003, but we have carpeting in the back bedrooms that needs to be replaced and we also did a glue down engineer wood in our master about 6 yrs ago that is not doing good with the moist slab. Our mistake with that because we bought inexpensive cheap wood flooring from Floor & Decor and who knows if the installer used the correct ratio of the probably cheap moisture barrier glue that was used. I was excited about the vinyl plank flooring but it just didn’t make sense to me to seal the floors with basically a totally non breathable floor thinking moisture is going to get trapped even with a barrier because it will be wet under that barrier and it didn’t sit well with me. Second, I can’t get past the clicking noise of a floating floor & I don’t care what they say about the quiet padding, it all is loud to me if walking on it without rubber shoes. I heard people get use to it, but I really don’t think I could. 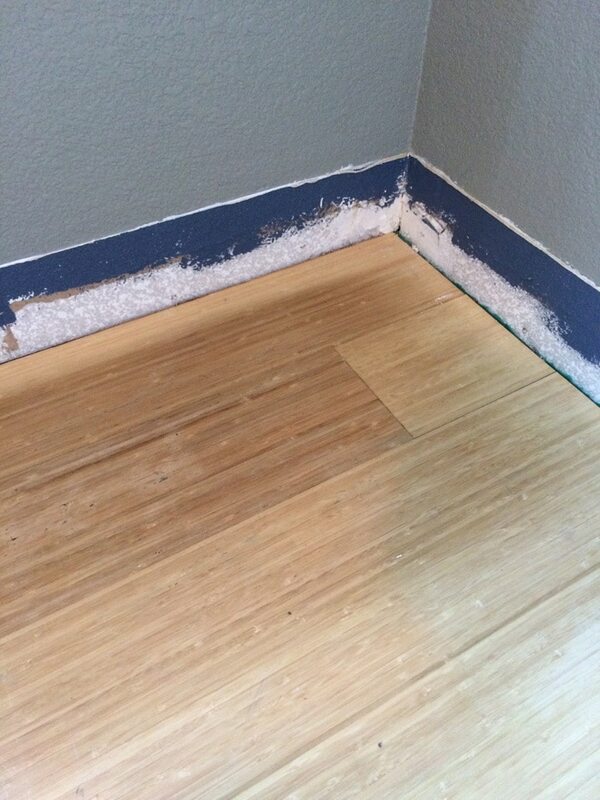 I am curious if you are curious to see what is happening under all of that vinyl flooring that you installed which is a hard decision because that requires ripping baseboard off to lift planks to check in your more damp areas. It has only been a year so may not be enough time, but I am being told out there people are starting to have issues of mold under their vinyl planks just like they were finding during the big laminate phase when that was time to replace. Moisture is still being trapped and sitting. The moist darkness in your old bamboo flooring could also be a cause of either cheap glue, possibly not even moisture barrier glue, also a good moisture barrier glue (which they make some that are good enough to not even require a moisture test) has to be trowed down to the right thickness with right trowel to be effective to which not all installers follow instructions for that. Also, bamboo is not as hard and good with moisture as a good hickory wood floor so it will also be weaker to stand up to moisture. I am mentioning all this due to my experience of working with a flooring manufacturer for the past few years, which I wish I was working at when I did my master bedroom & then I wouldn’t have used that cheap wood I did back when, and really started getting into the discussion with stores of their experiences of vinyl flooring since I started handling wood flooring for the past year. I was only handling carpet up until last year. I am being informed the mold issue is starting to arise from all this vinyl plank flooring has been in this phase of popular sales and just suggesting keeping an eye on your home. It may be a good idea to see what is going on underneath and inspect at some time. Again, thanks for your story. I am showing my husband some feedback about floors on moist slabs and came across your story. That’s honestly something I haven’t thought about. I guess I just figured that if the manufacturer instructions say they can handle a certain amount of moisture, then they should be okay. We took care of a lot of the drainage issues too, so I’m hoping that helped to dry things out. I don’t think I’d go taking up any floor unless I saw something wrong on the surface or started smelling. I see your point about the moisture getting bottled up and not being able to release though. Who would have thought flooring could be so complicated? Our bamboo flooring was floating, so I don’t think it had any glue. The moisture barrier wasn’t put down very well though. I don’t really notice much noise when I’m walking through the house, but I also don’t have much to compare it to. I’m probably also used to it. Thank you for taking the time to leave a response and good luck with deciding what to do with your house. I’ll make sure to keep an eye on the corner of the floor that was really bad and update here if anything comes of it. Great post! I’m going through something like this now. Bought a house last feb and out al new luxury vynal floors in but they didn’t put a moisture barrier under them since they said it’s not needed. Now that it’s raining I’ve noticed very high humidity inside the house and my master room is the worst. So I went outside and along my whole master room I have a lake of water almost to bottom of the stucco of house. I’m going to add drains hoping this fixes the problem instead of pulling up all the floor to add a barrier. I live in Sacramento ca area. Hi Adam. I’m in the Sacramento area as well. Small world, and crazy all of this rain we’re getting! That’s interesting that they didn’t put a moisture barrier down. I would probably look up the brand of flooring you got and read through the installation instructions to make sure that was right. I never really noticed high humidity inside the air in the house, just in the concrete slab when we tested it. The drains have definitely helped with the amount of standing water in the yard after the rain. It’s still pooling with the amount of rain, but it’s not nearly as bad and not right next to the house. You probably don’t want that water getting to the stucco! I don’t know if they are still doing it, but before we put the drains in, we were able to get free sand bags. I think it was some kind of county or city program. I hope you are able to get it figured out! Did the installers test your slab for a moisture level? Vinyl can still only take so much even though it’s waterproof. You don’t want mold. Also, the sellers should have disclosed poor drainage. If it’s a new build the builder might be responsible for adding drainage or grading. We weren’t able to get the sellers to do anything and didn’t feel like dealing with a lawsuit, but just fyi. Oh wow yeah small world! I’m in antelope. No they didn’t test the slab for moisture. And it’s not a new build I think it was built in 2002. I went to lows and bought a couple humidity sensors and have one in each room. My master bedroom is always the highest. Yeah, the only experience I have is with Calcium Chloride tests on the bare concrete foundation. I’d definitely get that drainage problem taken care of. Good luck figuring it out! Oh my gosh thank you SOOOOO much for your post. It has saved me from a heart attack and tens of thousands! Oh, I’m so glad it was helpful, and I hope you get your situation fixed! 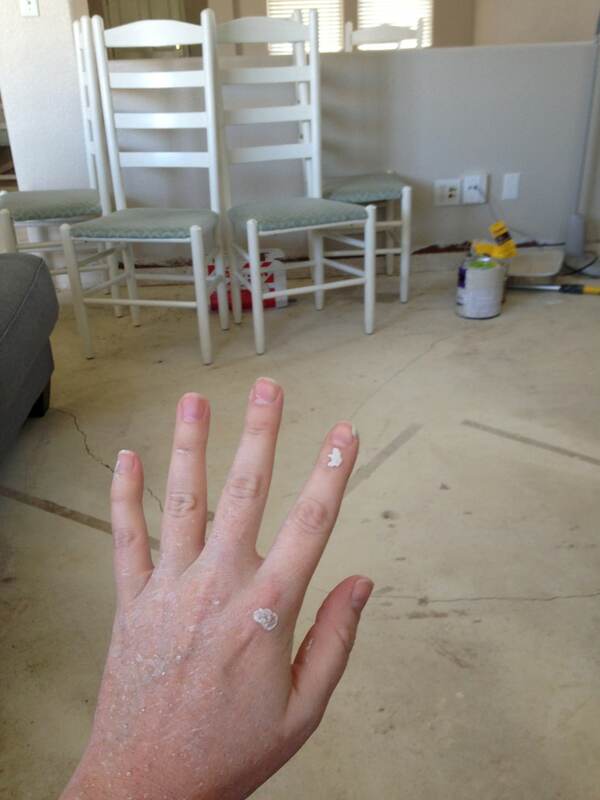 My wife is very allergic to penicillium mold and our house has been making her very sick from mold. Even though we remediate and our house looks super clean our ERMI mold tests look like those from a super moldy home. I’m wondering if it’s the new wood Floors we installed over a moisture barrier on slab. I highly recommend you do your own ERMI test and have someone air sample to make sure you got everything out and cleaned properly. Oh no, that’s really awful! Thankfully we didn’t have a lot of mold to contend with. It was fairly isolated in a couple of areas, and we ran the filter for days longer than we really needed to. I hope you get it figured out! I’m so glad it was helpful, and I hope you get whatever situation you are dealing with figured out!